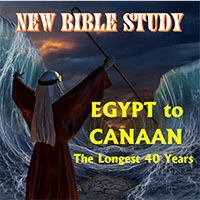 Bible Study Classes on "The Bible"
"Egypt to Canaan: The Longest 40 Years"
This Bible study follows God’s chosen people as they undertake the longest journey in history. What began as the trip of a lifetime soon became the trip that lasted a lifetime. This six session course provides insight into God’s plans, providence, and patience during the Israelites’ return to the Promised Land. Over 35 pages tell of the trials and triumphs from the plagues to the Red Sea, and from Mount Sinai to Jericho. This series also provides lasting lessons for ourselves. Includes charts, maps and insightful discussion topics. "Wisdom: A Gift to God's People"
This study provides insight into the Wisdom Literature of the Bible — with special emphasis on the book of Proverbs, a remarkable collection of gems that provide practical advice for daily living. Men on a Mission Bible Study "
This Apostles of Jesus Christ group Bible study takes a fascinating look into the personalities, words, and lives of the twelve apostles. From their calling into the ministry, to their time spent with Jesus, to their spreading of the Gospel for the infant Christian church, this study provides insight into the weaknesses and failures of these men, as well as the strength, perseverance, and faithfulness they found in the power of the Holy Spirit. How did Satan and his demons fit into the world of angels? How do God's angels minister to us? An introduction to the angels of the Bible. These 12 exciting stand-alone group Bible class sessions, or teen Bible studies, are great ways to fill in those unexpected gaps. They include interesting topics as well as fun group trivia. This Bible study course is great for confirmation instruction class, youth bible study, new church members, or as a refresher for your congregation. 1. What is the Bible, When Was it Written? This four sessions work well during Advent. The lessons presents in an informative and insightful manner the people, places, politics, prophecies, and plans God used when the “time had fully come.” Each Bible class lesson is four pages in length and includes maps, charts, and colored photos. These four sessions are ideal during Lent as they present the details of Holy Week, the Crucifixion, and Easter. This course provides interesting insights that help explain the path of a loving God as it unfolds into the greatest event that ever took place. Each lesson is four pages with maps, charts, photos, etc. "Portraits of Christmas & Easter Combo"
This program is a combination of the"Portraits of Christmas" and "Portraits of Easter" Bible studies. These six youth group Bible class sessions search the Scriptures to answer questions every Christian has asked. Rev. George Ferch (WELS) and Reynold Kremer present an insightful and informative Bible study of what the Scripture tells us about death, resurrection, judgment and eternity. Includes over 200 proof Bible passages. 2. What is Heaven Like? 3. What is Hell Like? A fascinating study that will take your Bible class to the land of Israel. Pastor Eugene Kock, leader of numerous trips to the Holy Land, shares his knowledge in the historical and biblical significance of six key cities, as well as recent archeological discoveries and what the sites are like today. Courses come with an introductory 4-minute slide show DVD introducing each lesson. "Getting to Know (and use) Your Bible"
The Bible Refresher course presents interesting background and educational information about the Word of God. Each session averages four pages and includes class discussion questions. In God’s Time includes seven stand-alone studies that provide insight into various “times” relating to Scripture. Each lesson is designed to help students get a clearer picture of how time relates to HIS-story. 6. How Did Jesus Use His Time on Earth?